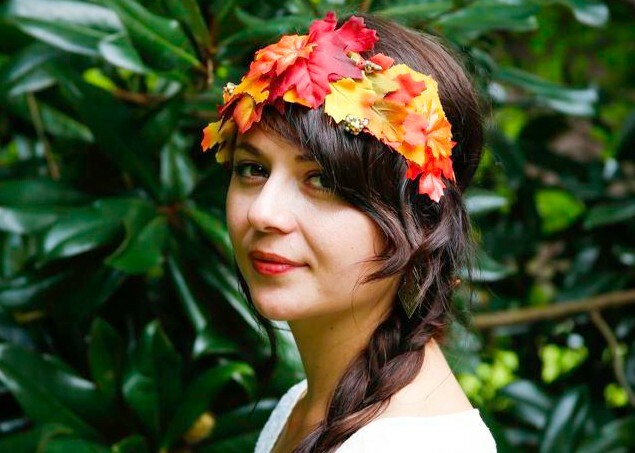 Make an inexpensive but beautiful head accessory using fall leaves, cord, and felt! Follow the tutorial on the source to create this idea. See this idea with the leaves standing upright on braided leather strings. See a tutorial for this idea using floral wire. See a tutorial for making a crown of ribbon-wrapped floral wire with small leaf accents. See a tutorial for weaving together the fall leaves using their stems. See a tutorial with a different way of weaving with the leaf stems to create a crown. See a tutorial for this idea using decorative tape.